There has been a lot of press around the Vatican's recent dismissal of its Chief Astronomer, Fr. George Coyne. The mainstream media has attributed Coyne’s removal to his outspoken opposition to the Vatican’s position on “Intelligent Design.” However, the true reason may be over Coyne’s refusal to acknowledge Pluto as a planet. Inside sources have relayed to MFRTZ that the Vatican sensed an immediate public affairs and recruitment opportunity when the International Astronomical Union decided on Pluto’s demotion. Allegedly, Pope Benedict XVI said (in a strong German accent), “Science really screwed the pooch in this one! If we issue a statement recognizing Pluto as a planet, we’ll rake in the Pro-Pluto demographic. This is just the kind of break we needed after the whole…well…you know.” He then stroked his chin, laughed maniacally, and ordered the Vatican Council to “take care of the details”. 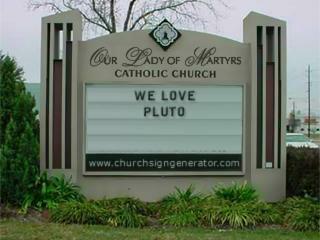 The Vatican is expected to conduct a press conference in the near future to discuss the details of the “Catholics for Pluto” campaign. We've heard rumors that beatification procedures have already been put into motion. Take THAT, science!